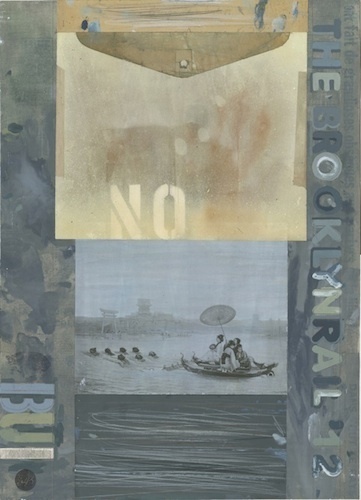 Phong Bui, “No,” #2 (Homage to Whistler), 2012, gouache, watercolor, oil crayon, Wite Out, with collage element, 16 3/4 x 23 1/4”. Phong Bui’s studio in the Greenpoint neighborhood of Brooklyn fell victim to a flash flood last August, claiming 20 percent of his art. Lining the floor of that space, Bui’s life work, accreted, became an unsalvageable bog, detrital and waterlogged. His current solo show is dedicated in part to Shoja Azari, who, during a post–flash flood visit to Bui’s studio, quasi suggested that Bui title his upcoming exhibition “After the Flood.” Unbeknownst to all was the prescience of this title for a show whose opening was held on October 29the night before Sandy, and a mere day before Bui’s studio would become submerged again, this time in over six feet of storm surge. The exhibition comprises twenty-one works, all exquisite conglomerations of collage, watercolor, gouache, and Wite Out, and all now a significant fraction of Bui’s surviving oeuvre (Sandy took over 80 percent of his work from the past twenty-five years). Belying the new gravity of their existence, these pieces are joyful, irreverent, and searingly childlike: “Untitled” (Joan and Susie) (all works cited, 2012), for example, features a handwriting sample from a child, copied and rewritten by Bui and embellished with splotches of pastel paint. This sheet is superimposed onto a handwriting worksheet of a noticeably bygone era; some of Bui’s source material dates back to the 1940s, suffusing his pieces with twentieth-century nostalgia, in this case neatly undermined by the sheet of newspaper that forms the base of this work: a copy of the newspaper L’Humanité, which Bui casually picked up on a trip to Vietnam last year. Perhaps the most poignant piece is the first to greet the entering viewer: “No,” #2 (Homage to Whistler), a gorgeous and wistful metal gray, features a newspaper clipping of an illustration of a Chinese familysome swimming, some rowing, all heading to shore. One thinks of Phong Bui’s own biography, of his and his family’s journeying to America by boat, illegally, as postwar Vietnamese refugees. How strange, and how mortal, for Bui to have gained safe passage across an ocean that would later wash the bulk of his work away.